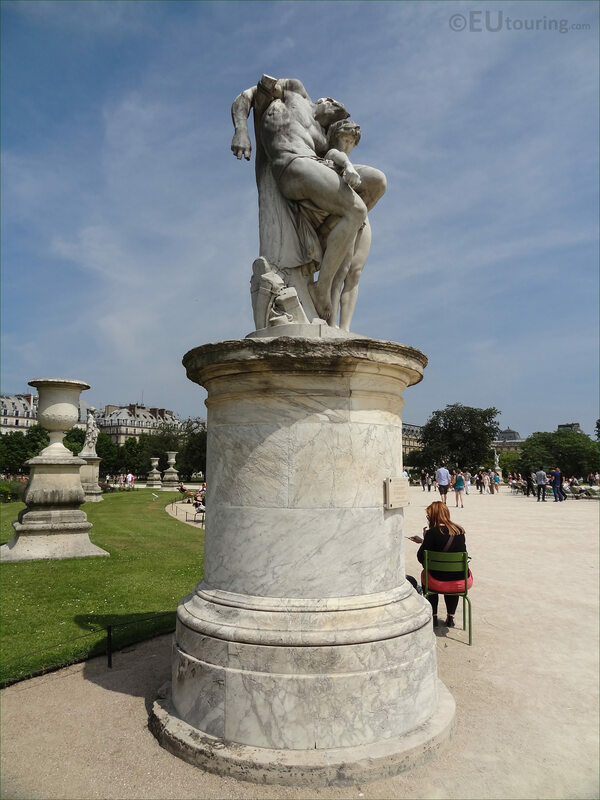 We were within the Jardin des Tuileries in the 1st Arrondissement of Paris, when we took these high definition photos showing a statue called Le Serment de Spartacus, which was sculpted by Louis Ernest Barrias. Le Serment de Spartacus translates in English to The Oath of Sparacus, and this first HD photo shows the statue, which was sculpted in marble between the years of 1869 and 1871 by Louis Enerst Barrias, who was born in Paris in 1841 and studied at the Ecole des Beaux Arts to become a French sculptor, winning the Prix de Rome in 1865. 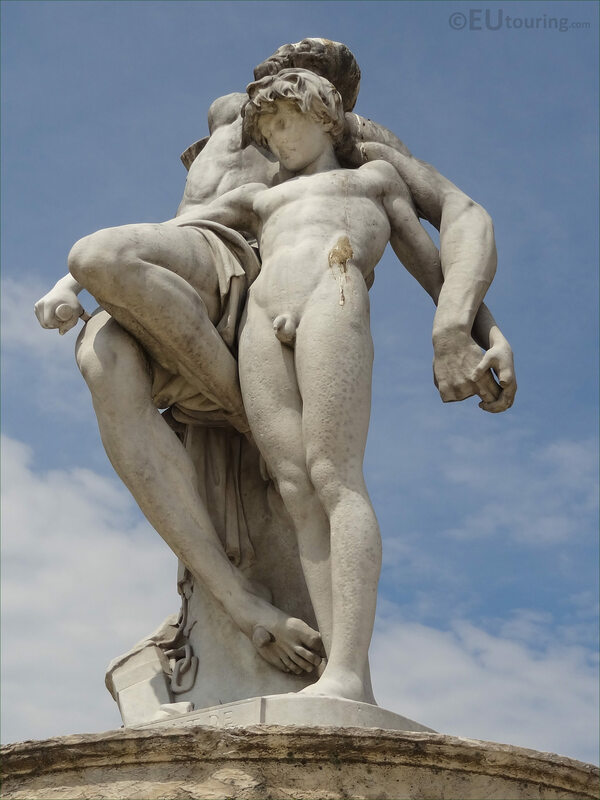 Yet here you can see a close up photograph showing the top part of The Oath of Spartacus and the detailing that went into producing this, which was while Louis Ernest Barrias was in Rome at the French Academy located in the Villa Medici, furthering his studies and career, and this was the last statue he sent back to Paris prior to his return. Now you will find that Le Serment de Spartacus was sculpted to depict Spartacus imagined as a young boy, who is helping a man that was subject to crucifixion, which is an ancient punishment for slaves, prisoners, etc during the early part of the Roman Empire, and in the above image you can see the broken chains of slavery located by the feet of the man. 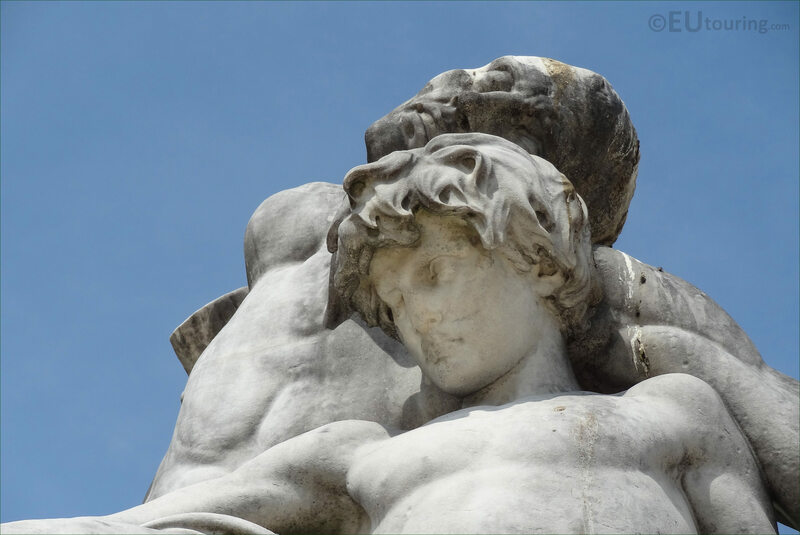 With this side view of The Oath of Spartacus marble statue you can see the remains of a tree that the man has been tied to for his crucifixion, with the young boy supporting him, but as though vowing to avenge his death, which is exactly what happened in history, when Spartacus led the greatest slave revolt that the Roman Empire had or would ever know. 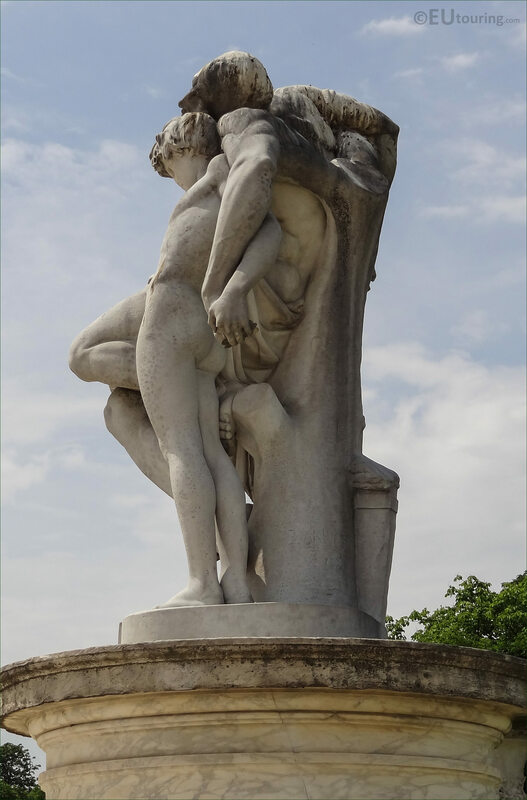 You will find that this particular composition was originally designed as a plaster model by Louis Ernest Barrias, prior to the execution of the full size marble statue and Le Serment de Spartacus was initially shown at the 1872 Paris Salon for French artists, prior to being placed within the Jardin des Tuileries in 1875. 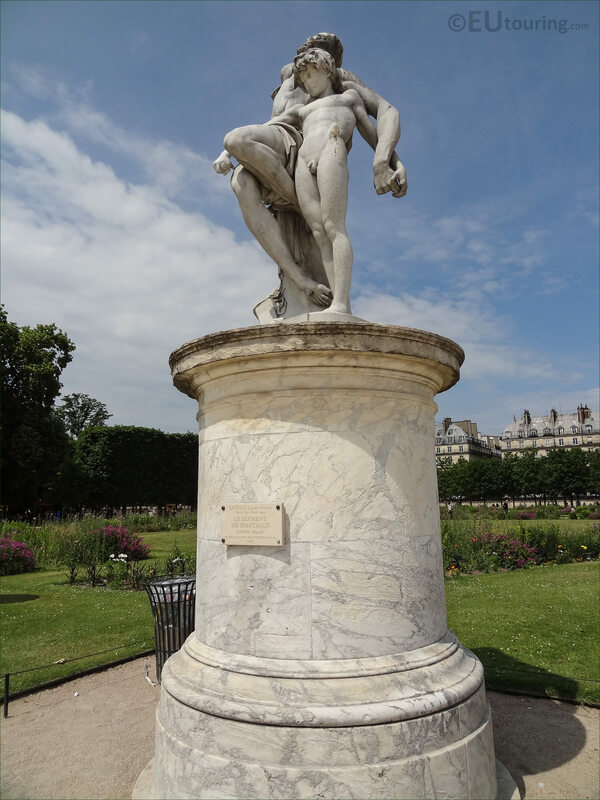 So, if you wish to discover The Oath of Spartacus marble statue, this is located within the Grand Carre area of the Tuileries Gardens, which is one of twelve that surround the Grand Bassin Rond, and as you are standing on the Allee Centrale looking towards the Large Round Basin, this is located directly to your left hand side by the parterre called the Demi-lune carre de fer nord. 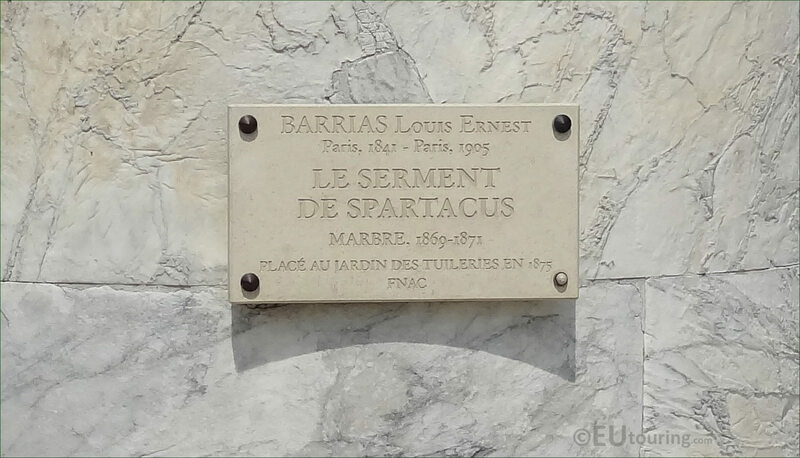 But here you can see a close up photo of the plaque, positioned on the pedestal base, beneath the front of the statue detailing the years of birth and death of Louis Ernest Barrias, being 1841 to 1905, along with details of when the marble statue was produced and Placed within the Tuileries Gardens that we mentioned earlier.